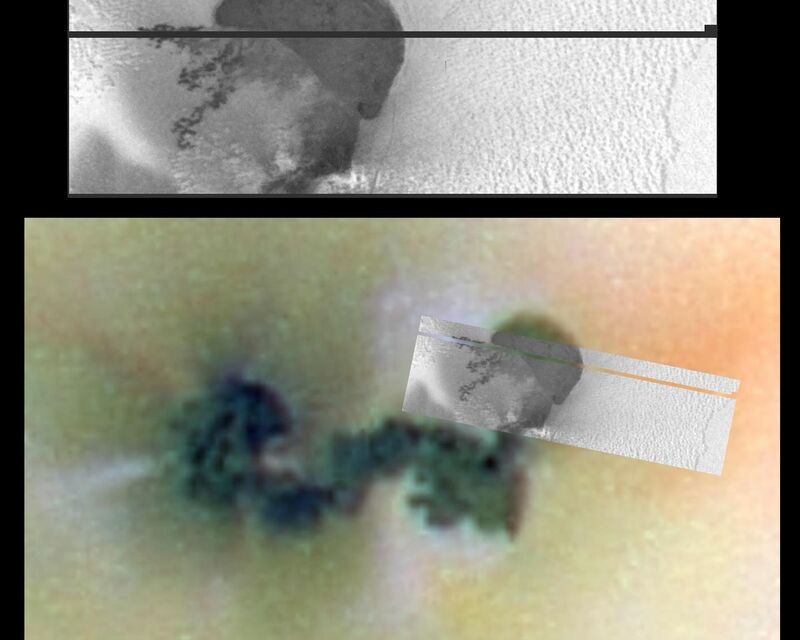 This is a high-resolution image of part of Prometheus, an active volcano on Jupiter's volcanic moon Io. The image was taken by NASA's Galileo spacecraft on October 10, 1999, during its close flyby of Io. It shows a volcanic caldera, a large depression formed by the collapse of the ground after a volcanic eruption. Some terrestrial examples of calderas can be found in Hawaii. This image also shows dark lava flows and a strange, lumpy surface covered with sulfur-rich snow. The new image is shown over an earlier, color view. In earlier, lower resolution images, it appeared that all the dark material at Prometheus comprised a single, long lava flow. 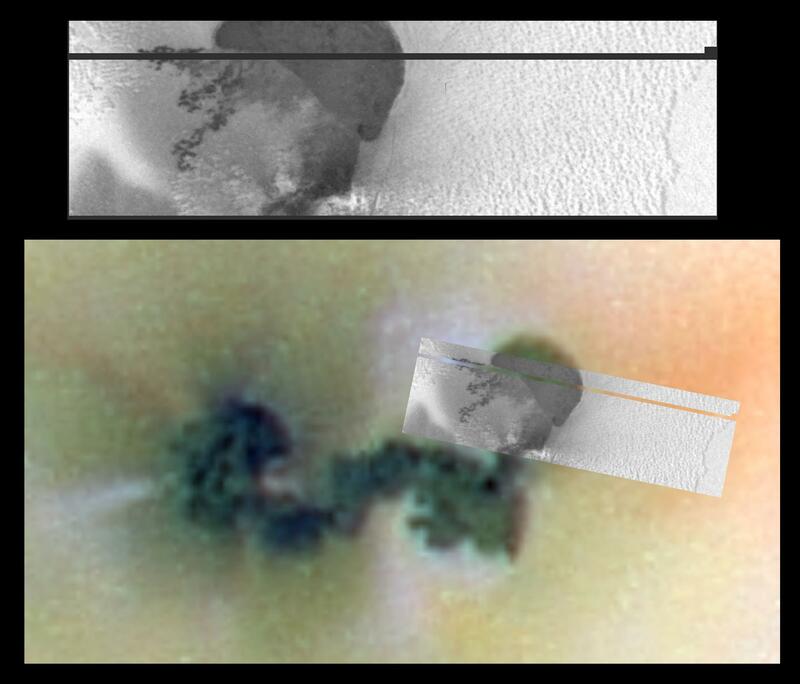 The new [sic] image shows for the first time that the northeastern end of this dark feature is actually a lava-filled caldera 28 kilometers (17 miles) long and 14 kilometers (9 miles) wide. The underground source of the Prometheus lava is probably beneath this newly [sic] discovered caldera. The lava flows that spill over the west rim of the newly discovered caldera clearly indicate that, at some point in time, the entire caldera was filled with lava. It is not clear whether the lava to the south of the caldera originally erupted within the caldera and flowed out, or if it erupted from a vent in the south and then flowed north into the caldera. Galileo scientists are intrigued also by the snowfield containing hummocks, seen to the east of the Prometheus caldera. They are currently examining a number of alternative models for their formation. 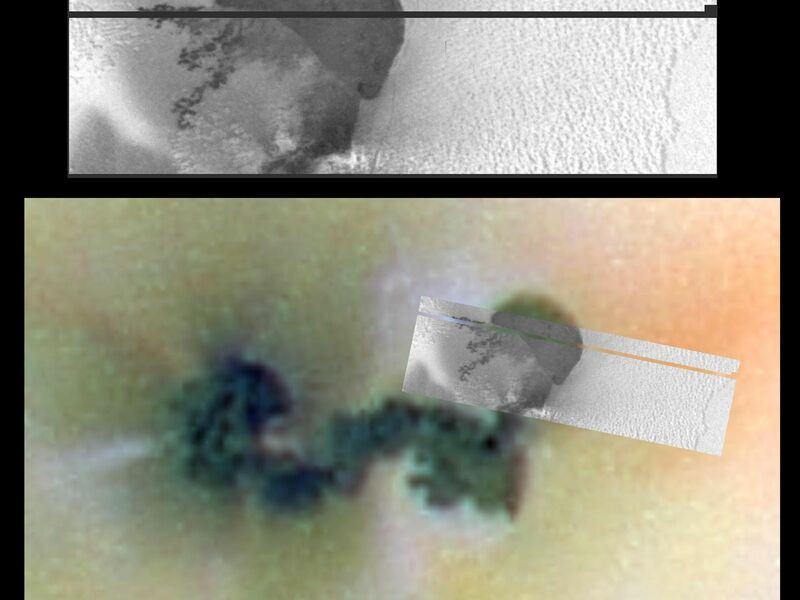 One idea is that the hummocks, or routed knolls, are the results of the supersonic blasts from Io's volcanoes plastering material onto one side of pre-existing lumps on the ground. The black and white, high-resolution image was taken with a filter that let in only a part of the infrared spectrum close to the visible wavelengths. The "color" of materials in the infrared is an important tool in determining the chemical composition of planetary surfaces. North is to the top of the picture and the sun illuminates the surface from almost behind the spacecraft. The resolution is 120 meters (400 feet) per pixel element. This resolution is more than 10 times better than the previous best view of this region. The image covers an area about 96 kilometers (60 miles) wide and 29 kilometers (18 miles) high. It was taken at a distance of 12,000 kilometers (7,500 miles) from Io by the camera onboard Galileo. This image and other images and data received from Galileo are posted on the World Wide Web, on the Galileo mission home page at http://galileo.jpl.nasa.gov/. 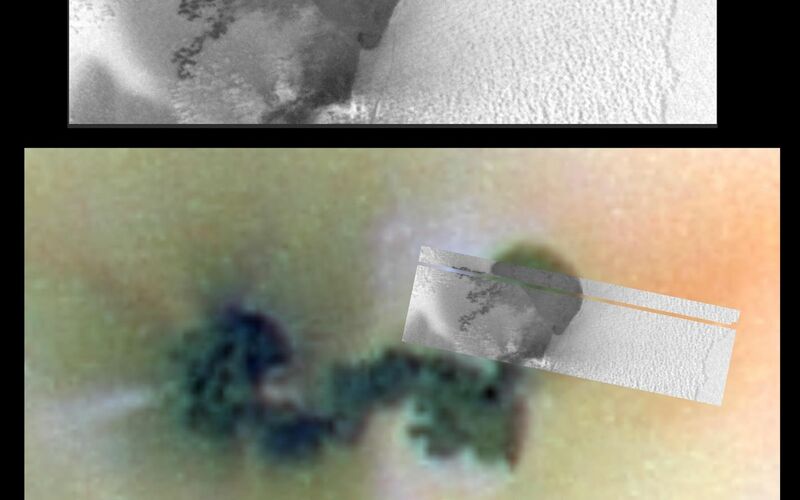 Background information and educational context for the images can be found at http://galileo.jpl.nasa.gov/images/images.html.